Darth Vader’s story starts and ends as our Greatest Hope. He was the light and future for his mother. He was the chosen one for Qui-Gon Jinn and Obi-Wan Kenobi. He was the love and future for Padmé. We can all relate to those specific hopes and dreams…. and we know how it feels when they are shattered. This is why we feel the tragedy of Anakin’s descent so deeply. Vader is also our Greatest Fear. He has the ability to destroy civilizations, but most movie super villains can do that. Lots of bad guys/gals in thrillers and dramas are absolutely terrifying in their ability to calculate and to hurt the people we love. Again, Darth Vader is no different. No, I think the real reason why Darth Vader is scarier than the rest, is something much more visceral and personal. You can see it in Luke’s face in Empire Strikes Back, when he found out Vader is his father. That primal scream! The audience’s GASP! when we heard “I AM YOUR FATHER!” We simply did not want to believe it. Those 4 words tapped into the fear that we might not be who we think we are. If someone as innocent as Luke can come from someone from of the dark side, what does that make Luke? What does that make US? Darth Vader forces us to grapple with some of the most terrifying questions there are: Is there evil in us too… could we succumb to it, and if so, could we also hurt the ones we love? Anakin’s decent is just as horrifying as that revelation… but instead of a jolt, it is a slow agonizing process. Re-watching the prequels as a parent, I realized how absolutely TERRIFYING those movies are. The idea that a precious child, who is loved above all things on earth, can be seduced by the dark side was devastating to me. That, in the end (after all our good, best effort parenting! ), there might not be much a parent can do to stop such a thing… or worse, unknowingly helping that process along. That someone so innocent could turn so bad. That something that comes from us, could turn evil. THIS is what nightmares are made of. Then after making us question our very own goodness (or lack-there of), in the end, Darth Vader again embodies our Greatest Hope. There WAS still good in him: He becomes Luke’s and the rebellion’s only hope of survival. By extension, he is OUR only hope of survival. If he can be redeemed, then we can be forgiven the mistakes we have made along the way. There is hope, forgiveness and redemption for us, for our parents, and for our children. Well…. this post got a bit more serious and deep than I had planned. But I want to end of another note. A few weeks ago I voiced my excitement at the rumors that Hayden Christensen would return as Darth Vader in Rogue One! Well, it looks like that is a NO GO, though nothing has been confirmed yet. Still no words on whether James Earl Jones will do the voice – but I think the Star Wars universe would explode, and millions of voices suddenly crying out in terror, he if wasn’t. 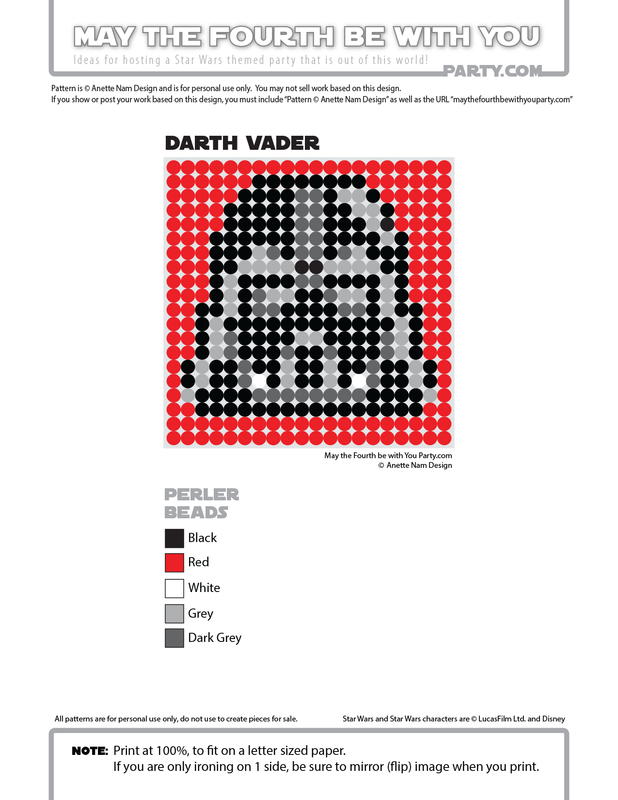 So without any further ado, here is Darth Vader, #54 in the Perler bead/cross stitch/crochet/knitting/Lego/pixel/mosaic pattern series. Schizophrenia is such a devastating disease, and treatment is absolutely vital! Thanks for reminding us about Jake’s plight. Our prayers are also with him and his family! My son is so going to want to make this.! Beware, Perler beads are ADDICTIVE! 🙂 It’s like those Lay’s Potato Chip commercials… I bet you can’t make just one!